As a teenager, German architect Anna Heringer spent time working with a sustainable development NGO in Bangladesh. The experience convinced her of the wisdom of relying on locally available resources—a lesson she has since applied on projects around the world. METI School, whose design and construction were intended to spread knowledge of the area’s traditional construction techniques. 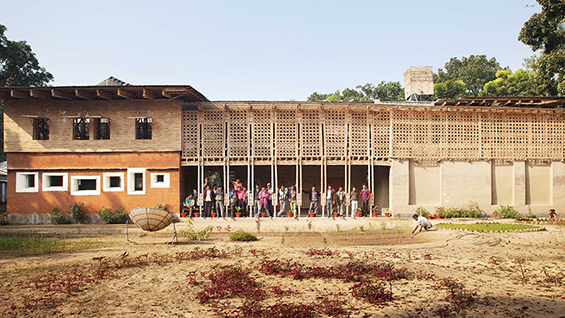 DESI Vocational Center, a training facility that reinterprets vernacular Bangladeshi housing. Didi Textiles, a fashion company that aims to provide good local jobs in order to reduce migration to the cities. Nartaki building, a mud-walled facility that will provide training and employment for people with disabilities. Heringer received her architecture degree from the University of Arts Linz, where her thesis focused on Bangladesh. She is a recipient of the Aga Khan Award and the Global Award for Sustainable Architecture, among others. She has taught at Harvard’s Graduate School of Design, ETH Zurich, the Technical University Vienna, and other schools, and her work has been exhibited at the Venice Biennale, MoMA, and the Victoria and Albert Museum. The talk will be followed by a conversation with architect Toshiko Mori. Tickets are free for Cooper Union students and faculty with valid ID, and League members.